Description: Collection of five frontispieces for comedies and tragedies by Pierre Corneille. Artists and Engravers: Anonymous. FYI: "David Garrick as Richard III is a painting dating from 1745 by the English artist William Hogarth. 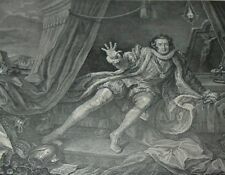 GARRICK AS RICHARD III taken from Original by William Hogarth. THE PRINTS IN THIS BOOK ARE FRAMABLE. It would be a Nice Rare opportunity to acquire a Nice Rare Original Photo Image seldom if ever seen that you can easily display and Enjoy. This is a rare opportunity to acquire mostly never before seen images for your Collection that are Fresh to Market. SAUL JACOB RABINO. Born in Odessa, Russia on July 8, 1892. Rabino (né Rabinovitz) studied at the Russian Imperial Art School and Ecole des Arts Décoratifs in Paris. He died there of cirrhosis of the liver on Oct. 29, 1969. 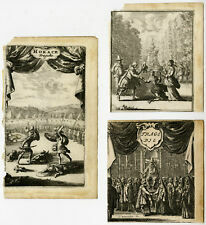 Description: Collection of three frontispieces for comedies and tragedies by Pierre Corneille. Ref: Hollstein 19. Artists and Engravers: Made by 'Abraham Santvoort' after own design. Abraham Santvoort (ca. 1611-1669) worked in Breda and Brussels. Depicting: College Girls In Shakespeare's Plays, Dbl Pg. Title: College Girls In Shakespeare's Plays, by Carolyn Halsted. "Central park". Note : There will be white space on each corner of the print that depends on the size. We reproduce the very rarest of crate labels. Even seasoned collectors will buy reproductions from us, storing their original fruit or vegetable crate label in a book with acid-free paper and hanging up the reproduction on a wall for display. 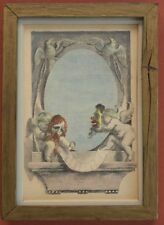 For sale we have a rare Pochoir print titled Decors De Theater. Paris 1930. May I particularly suggest Browsing through our Many Famous Celebrity Photo Images. However, an overwhelming amount of them have been examined and appear to be perfectly fine. It would be a Nice Rare opportunity to acquire a Nice Rare Original Photo Image seldom if ever seen that you can easily display and Enjoy. All of our prints are bevel matted in a very high quality, and simple off-white/ivory matting. 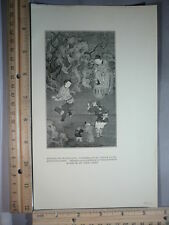 The print is about 8 1/4" x 11 1/4" (including the border around the image, if any). Great vendor. Beautifully matted, just as described. 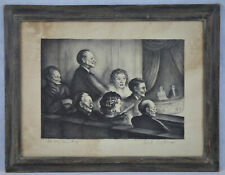 Artist : FRANZ FELIX, SIGNED IN PLATE. The cover features Marilyn Miller. This series of art covers are beautifully illustrated and would look wonderful in a grouping of similar covers from the period. Do you live in the greater Chattanooga area?. E.g 1855, 1896 etc. This is a rare opportunity to acquire mostly never before seen images for your Collection that are Fresh to Market. Take a few minutes to look you'll be glad you did. As is many of the photos are personal and very unique in one way or another. TITLE: A BOX OFFICE ATTRACTION. All of our prints are bevel matted in a very high quality, and simple off-white/ivory matting. The print is about 8" x 10 1/2" (including the border around the image, if any). This print is bevel matted in high quality acid-free matting. The color is an off-white/ivory, specifically selected for these special prints. The tape used to attach the print to the matte is artists tape. Edwin Austin Abbey (1852-1911). The Painting depicts Beatrice in a scene from Much Ado About Nothing, Act II Scene I. While working as an illustrator for the publishing house of Harper and Brothers, New York City, Abbey began to create illustrations for the poems of Robert Herrick in 1874. 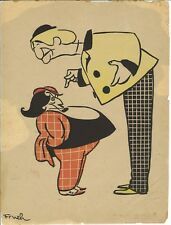 Bevel-matted lithograph from a first edition book of drawings, "RAKE'S PROGRESS," illustrated by David Low, and published in 1934. TEXT: THE RAKE INVESTS IN THE MOVIES. The print, including the border, is 10" x 14 1/2". AR TIST : HOKINSON. All of our prints are bevel matted in a very high quality, and simple off-white/ivory matting. The print is 8 3/4" x 12 1/2". JUST AS DESCRIBED. GREAT MATTING! All mats are acid-free and the small piece of tape used to attach the print to the top of the mat is artists tape. Ernst Stern. As Stern's design aesthetics tended towards serenity and realism, however, this pairing was not always successful. Born in Bucharest, Romania, to Jewish parents of German and Hungarian origin, Stern studied under Nikolaos Gyzis and Franz Stuck at the Academy of Fine Arts, Munich beginning in 1894. Artist : HAL PHYTE, SIGNED IN PLATE. Feature : PEGGY WOOD. The cover features Marilyn Miller. This series of art covers are beautifully illustrated and would look wonderful in a grouping of similar covers from the period. Ernst Stern. As Stern's design aesthetics tended towards serenity and realism, however, this pairing was not always successful. Stern moved to Berlin in 1905, where Max Reinhardt hired him the next year as a set designer for the Deutsches Theater. Cover personality: MARTHA LORBER. Artist : Albert Vargas, signed in plate. All of our prints are bevel matted in a very high quality, simple off-white/ivory matting. The cover features Marilyn Miller. RAPHAEL SOYER'S 1939 LITHOGRAPH. Fine 1939 Print-not a modern reproduction. Bright Authentic Artwork. Excellent condition. Charles Lucien Leandre was a French caricaturist and painter born in 1862. Printed on a sturdy sheet of light glossy paper and attached directly to the mat.